You needn’t worry about additional services in the pursuit of Search Engine Optimization (SEO). so your website, online shop or blog can be easily optimized and found by those who are interested. 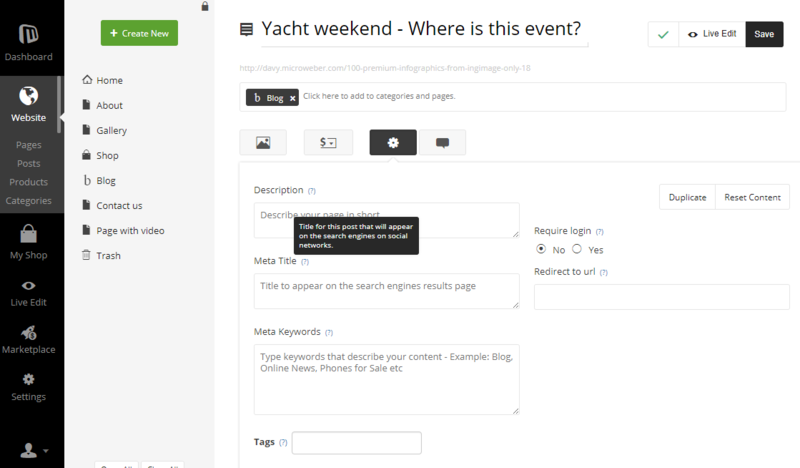 Microweber CMS pings search engines each time when you publish new post or product. This way Google, Yahoo, and others search engine bots, comes to your website to index the new content. This is what MW makes for you automatically, helping you have better results in the search. For those of you who are more in deep into SEO services Microweber support XML, Robot.txt and others important formats. You can find the SEO settings under the "Settings" sections in the admin panel. It's a dropdown menu, where, once you click, you will see "Advanced". Go there and select the SEO Settings, Custom head tags or some of the other buttons to finetune your website, online store or blog. To work on the SEO and Meta tags of a given page, product or post, click on it and select the "Settings" option (the blue button underneath the title). Once there, select the "Advanced" tab and you are ready to go.